A monumental history of the nineteenth century, The Transformation of the World offers a panoramic and multifaceted portrait of a world in transition. 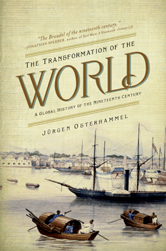 Jurgen Osterhammel, an eminent scholar who has been called the Braudel of the nineteenth century, moves beyond conventional Eurocentric and chronological accounts of the era, presenting instead a truly global history of breathtaking scope and towering erudition. II Time: When Was the Nineteenth Century? III Space: Where Was the Nineteenth Century? 3 What Holds Empires Together? XII Energy and Industry: Who Unbound Prometheus, When, and Where? 1 Is a Global Social History Possible?